Rich in exotic wildlife, tropical forests, white-sand beaches and lost civilisations, Belize really is a diverse pocket of overlooked beauty. This is a trip that has something for everyone - food lovers, wildlife spotters, jungle hikers and beach junkies alike will all find something to love about Belize. If you have booked your flights through our office then you will spend the first night of the trip in Houston at an airport hotel. Our hotels have a frequent complimentary shuttle service from the airport that you will need to catch (further details about this will be given to you in the joining instructions section of your trip notes), and you'll have the evening free to explore. You will then fly on to Belize City tomorrow morning to meet the rest of our group and our local leader. If you are booking your own flights, you will arrive and check-in at the first night's accommodation in Belize City. Belize City was the capital of Belize until 1970 and is a typical Caribbean town. Parts of the town are still largely built of wood and galvanised iron, with many of the original colonial style houses in an elegant state of disrepair. There is also a canal system through the old part of town and Creole English is widely spoken. If you have spent the last night in Belize City then this morning you will drive from the hotel along the northern highway to pick up the people joining from Miami or Houston at the international airport. From here we will visit the Maya Ruins of Altun Ha with a local guide. Later, we arrive at Crooked Tree Wildlife Sanctuary, where we settle down for two nights enjoying the hospitality of our local hosts on the shores of the Crooked Tree Lagoon. Rising early this morning or tomorrow morning, we explore the lagoon by boat. In this birdwatchers paradise we may spot wood stork, numerous herons, vultures, kingfishers, raptors and shore bird, and perhaps most notable of all, the rare jabiru stork - the tallest flying bird in the America's standing at 5ft with a wingspan of up to 9ft. We return to the lodge for breakfast and then set off by vehicle to the New River for the boat ride upstream to the 2000 year old jungle ruins of Lamanai. Water birds are abundant in the ancient rainforest cover and crocodiles may be spotted lurking along the river bank. Lamanai, the original name of these Maya ruins, means Submerged Crocodile, which helps to explain the numerous carved crocodile representations at the site. The ruins are located some distance off the beaten track and are still not reconstructed or cleared. We approach on foot following rough trails. The surrounding rainforest with its thick canopy of huge trees, and humid atmosphere adds an aura of mystery to the scattered and overgrown relics. A cache of children's bones has been unearthed from beneath one of the stelae, suggesting that the Maya practiced human sacrifice here. An optional early bird walk and sunrise along the Crooked Tree Lagoon can be an unforgettable experience in this important wetland sanctuary. After breakfast, we visit the Community Baboon Sanctuary in search of howler monkeys. Here we have a chance to watch troops of black howler monkeys swinging from the trees in their natural habitat, before we begin our journey south along the scenic Hummingbird Highway, where orange and grapefruit groves are surrounded by a backdrop of lush jungle clad limestone hills - The Maya Mountains. We will visit a local organic farm and tree planting project along the way in this beautiful setting. Our day ends in the beach resort of Placencia, a town located at the end of a narrow peninsula between mangrove lagoons and the Maya Mountains and the Caribbean Sea. Placencia is southern Belize's premier beach spot and a jumping off point for visiting numerous cayes that form part of the Belize barrier reef - the longest reef system in the western hemisphere. Today, we have the option to visit Laughing Bird caye. It lies 9 miles west of the Placencia Peninsula and is an area of specific biological interest within the world heritage site. It is a picture postcard uninhabited tropical island that allows us to experience a guided snorkelling trip directly from its coral sand shores. Alternatively, you might like to relax and enjoy local life at the beach in Placencia. This morning we visit the Cockscomb Basin Wildlife Sanctuary. This is the world's first and only jaguar reserve, in the heart of an important large tract of undisturbed tropical forest that is thought to have the densest population of jaguars in all the America's; the magnificent cats are a protected species here in their natural habitat and are no longer hunted as big game: however we would have to be extremely fortunate to spot one. They can grow up to six feet in length and weigh some 159 kilograms. The reserve is home to five species of wild cats, wild pigs, dwarf brocket and white tailed deers as well as Belize's national mammel - the Tapir. The park is also home to more than 300 species of birds that can be found on an extensive network of maintained trails. We plan to do a hike through the rainforest to a small waterfall and for the more energetic a hike to the clearing of "Ben's Bluff" that offers incredible views of the forest and towards Belize's most iconic mountain - Victoria Peak at 1120m. Leaving the park we drive on towards San Ignacio on the hummingbird highway, we can stop at the "other" Blue Hole - a collapsed limestone cavern for a welcome swim in fresh water in yet another large protected forest reserve - the Blue Hole National Park. San Ignacio, a traditional Belizean town, is an ideal place to base ourselves for the next couple of days. Straddling the Macal River which was once a critical transportation artery for the Maya and later the European settlers it is now a centre for many adventurous activities. Today we make a visit to the great classical Maya site of Xunantunich, Mayan for 'Rock Stone Maiden', perhaps for phallic or fertility reasons. We go by bus and then cross the River Mopan by traditional hand-winched ferry to arrive at the site. Occupied until about AD 850, the main plaza is dominated by an awesome structure called El Castillo - a massive pyramid which rises to 40 metres. On the top is a partially restored stucco frieze representing the Sun God and astronomical signs of the Moon and Venus. The superb view from the summit looks out over the forest with the Maya mountains to the south and the lowlands of Guatemala to the west. After visiting Xunantunich, we journey to San Ignacio and the lively market, full of Belize's colourful cross section of diverse people and the local produce they bring to town from the surrounding hills on a Saturday. The afternoon is free for personal exploration or cave canoeing into the Mayan underworld at the stunning Barton Creek cave system, located near to the Orthodox German Mennonite Communities found in Belize's interior. Today is free to relax in the hotel's gardens and pool or perhaps make an independent visit to the nearby Cahal Pech Archaeological site - a popular option is to visit one of the region's most impressive botanical gardens - the Belize Botanical Gardens. This extensive botanical collection in the Macal River Valley is surrounded by Rainforest and rich in wildlife. From the gardens, we can paddle by canoe through unspoilt jungle scenery back to San Ignacio. 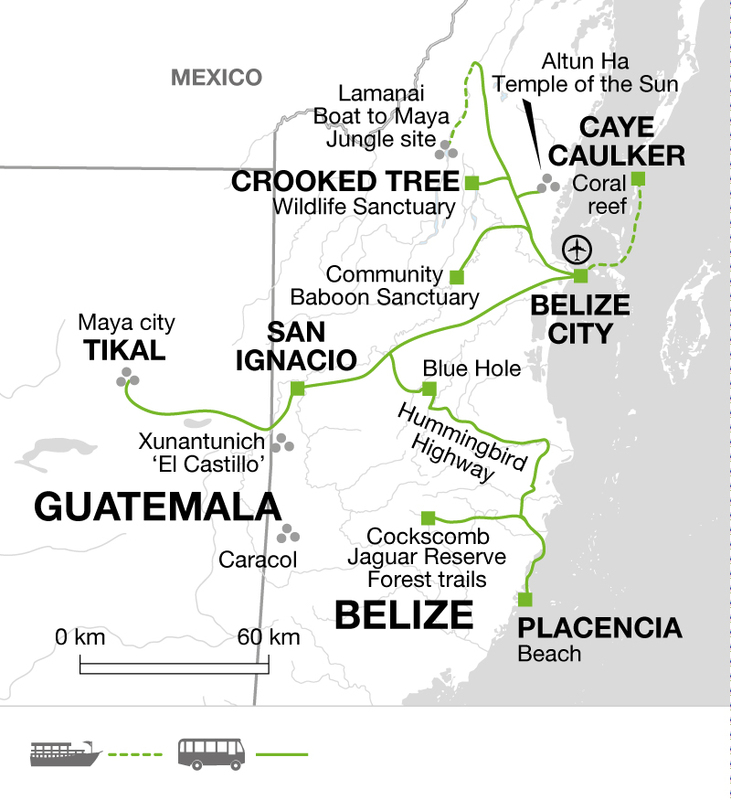 Leaving Belize today we drive to Tikal, just over the border in Guatemala. Arriving at Tikal we spend the day exploring this great Mayan metropolis, which can justly be compared with Egyptian and Greek masterpieces. Initially settled about 600 BC, Tikal was abandoned by its rulers around AD 890 and totally deserted a hundred years later. The city covered an area of 16 square kilometres. Re-discovered in 1848, only a few of its great temples and pyramids have yet been excavated. Accessible by foot are a number of outlying and little known temples still covered by a tangle of undergrowth, and for those with a head for heights, the views from the temple tops out over the jungle and the hidden city below are mesmerising. Today we rise to the sounds of the surrounding jungle coming to life. Unaccompanied, we have a chance to return to the site for a further exploration of the jungle encroached ruins. It is possible to go into the site to watch the sunrise from atop of Temple 4, the highest structure in the site at more than 200ft above the forest floor. Clear sunrises are uncommon however owing to the humidity the rainforest generates. Witness instead the roof combs of the surrounding temples reveal themselves as a forest wakes and the sounds of toucans, parrots, spider and howler monkeys fill the air. Alternatively you can enjoy the day relaxing, excellent bird watching and wildlife can be seen around the hotel pool! There are two small museums located close to the hotel, or you may like to visit Guatemala's second largest lake - Peten Itza - and the colonial island town of Flores. This morning we drive to Belize City and take a water taxi to Caye Caulker. Once a pirate lair, this tiny but enchanting tropical island lies 34km northeast of Belize City and about 1.6km inside the greatest barrier reef in the Western Hemisphere. The water taxi transfer takes about an hour and is a highlight in itself, speeding through the turquoise waters. The island remains uncrowded, and unluxurious, with relatively modest prices in restaurants and bars, owned and run by the friendliest of local people. The local fishermen produce lobster, conch, fish and crab to supply the domestic and foreign markets. Fresh seafood is readily available and lobster is the best buy when in season from Jun to Feb. There's time to relax - our hotel has a beach, which is rare on the island - as well as to enjoy a number of optional trips. You may take a snorkelling trip out to the nearby Hol Chan Marine Reserve & Shark and Ray alley, or take a full day trip out to Goff's Caye to observe the Manatees in their natural mangrove habitat. Scuba diving is also available. Today we spend some time either relaxing or we can participate in one of many of the optional activities available on the island. Today we have another day to enjoy the various activities Caye Caulker has to offer. Return mid-morning by boat to Belize City where the Land Only tour ends. Clients on the group flights to London transfer to Belize City International airport. Placencia - Full day boat excursion to Laughing Bird Caye US$90. Scuba diving available at approx US$75-125. Bring lightweight, informal clothing. A jumper or fleece is advisable for cool evenings and you'll need a good waterproof jacket all year round or an umbrella. Long sleeved shirts and long trousers give protection against thick forest growth and insects on jungle walks. A swimming costume and sun hat are essential, and a snorkel rash guard shirt is strongly advised for snorkeling options. Lightweight trail boots are preferable for jungle paths, and you'll want to bring sandals. Bring shoes you don't mind getting wet for exploring caves and wet beach landings. One main piece of luggage and a daysack. Remember, you are expected to carry your own baggage so don't overload yourself. Insect repellent, a torch, water bottle, and suncream. Binoculars are essential for bird watching. To assist with this the Tour Leader may organise a group tips kitty for included activities and meals, they will then account for kitty use throughout the tour. For this we suggest US/CAN$ 45. Belize: Visas are not required for UK, New Zealand, Australian, US and Canadian citizens. Guatemala: Visas are not required for UK, New Zealand, Australian, US and Canadian citizens. Other nationalities should consult the relevant consulate. This tour has it all - culture, nature and relaxation. Belize is a beautiful, often overlooked country. Discover Maya sites, view wildlife at Crooked Tree Wildlife Reserve, stay in a jungle lodge at Tikal (Guatemala) and enjoy time at the end to relax on Caye Caulker.